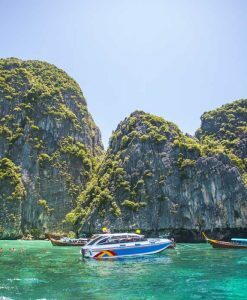 Afternoon big boat tour from Phi Phi | half day sigh seeing snorkeling and kayak trip by big boat from Phi Phi Don to Phi Phi Leh. 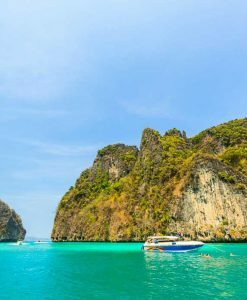 You can also join this tour on the same day you arrive to Phi Phi Island, Afternoon big boat tour from Phi Phi, your Check-In for your half day trip will be at Phi Phi Don Island, at the Chukit boat trip counter at Tonsai Pier. 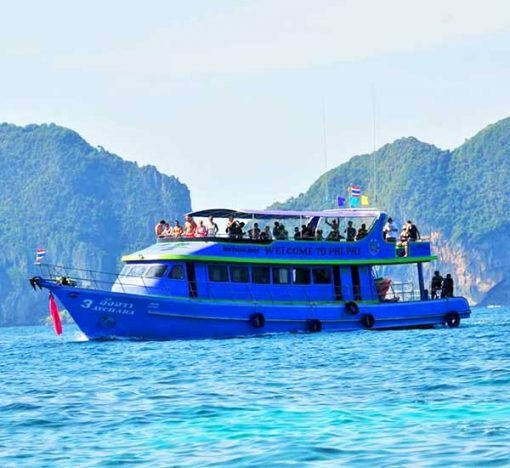 Afternoon big boat tour from Phi Phi Natural Park fees are NOT included in the price! 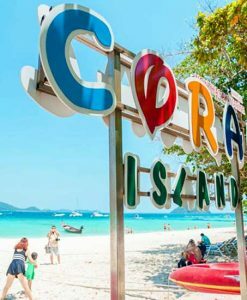 Pay cash on tour 400 Thai Baht per adult and 200 Thai Baht per child! 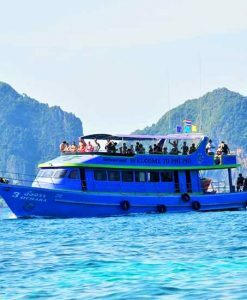 Afternoon big boat tour from Phi Phi is a half day trip by big Boat from Phi Phi Don to all Phi Phi Leh National Park main attraction points. 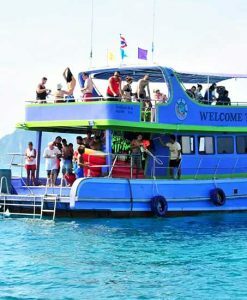 Big Boat have a covered area for sun protection and an open deck for sunbath, plenty of space. 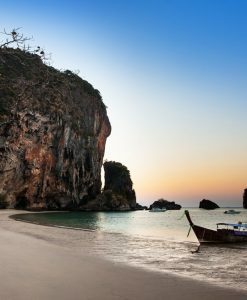 Visit and sight see Loh Samah Bay, Maya Bay, Monkey beach, Viking cave, Pileh Lagoon [National Park], Sunset Point. 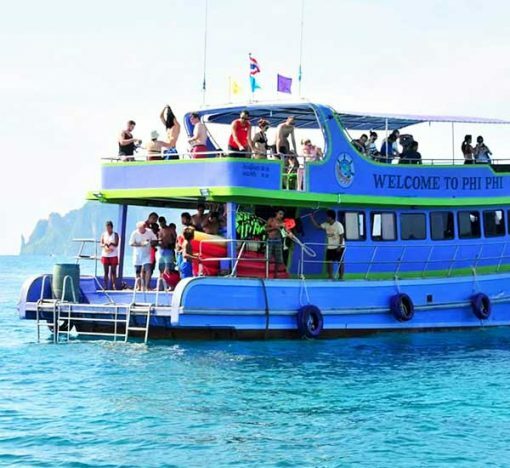 Afternoon big boat tour from Phi Phi also offers all included soft drinks, drinking water, life jacket, free equipment for snorkeling and Kayak, tour guide, insurance! 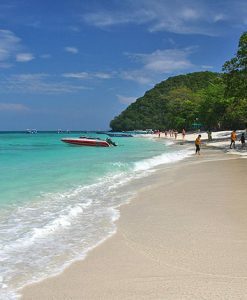 Remember please to bring with you swimming suits, light t-shirt, beach towel, sunblock and sunglasses, camera! “2.00 PM – 6.30 PM: Tour start”: Meet before at 1,30 PM your tour staff and tour guide at the Chukit boat trip counter at Tonsai Pier, after a briefing we can start Afternoon big boat tour from Phi Phi. This big boat afternoon tour stops at what we all consider nicest locations on the Phi Phi Leh Natural Park island. 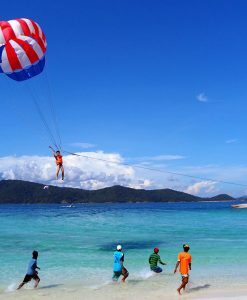 We will have fun during snorkeling stops, sight-seeing stops, we will have time to relax on the beautiful beaches. 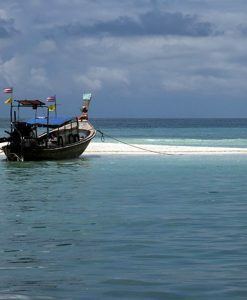 Visit and sight see Loh Samah Bay, Maya Bay, Monkey beach, Viking cave, Pileh Lagoon [National Park], Sunset Point. 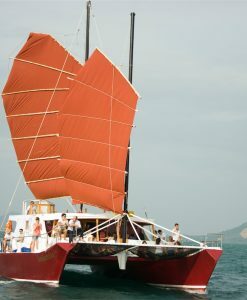 DEPARTURE / RETURN LOCATION: The meeting point is at the Chukit boat trip counter at Tonsai Pier. There is no hotel collection for this trip. 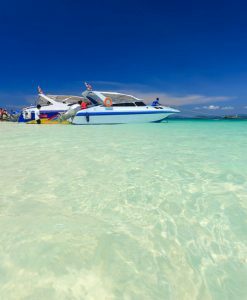 Life jacket, English speaking tour guide, Snorkeling gear and Kayak, Insurance! Afternoon big boat tour from Phi Phi program may change depending on tide and weather conditions, may be modified without notice to fit the tide and local weather conditions. 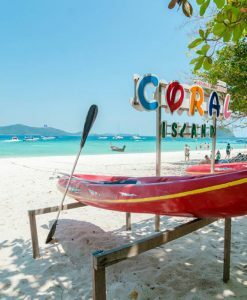 Checking seat availability before booking is always strongly recommended. 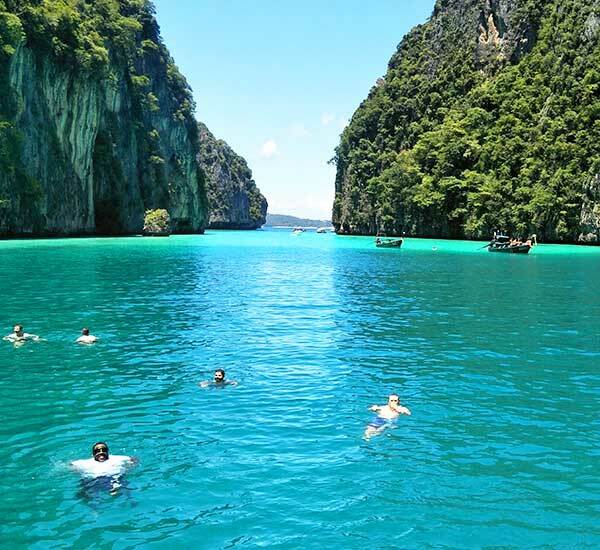 Afternoon big boat tour from Phi Phi, no refunds for changes of the itinerary or program due to risks of tidal or sea conditions. 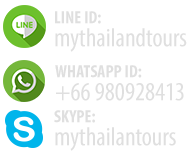 Please feel free to contact us and tell us your preference. 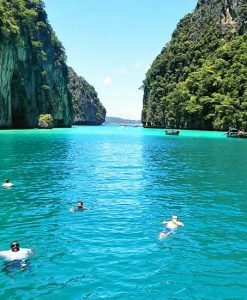 Afternoon big boat tour from Phi Phi. 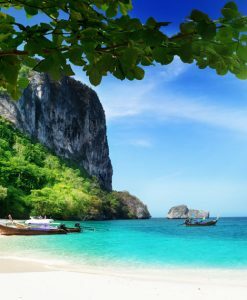 Look another wonderful Phi Phi island tour if you might want to depart from Phuket; Phi Phi island sunrise tour, Phi Phi Sunset tour, Premium with Bamboo Island, by Cruiser.